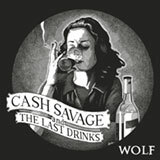 Cash Savage is one of the most respected and talented songwriters in Melbourne. With her band The Last Drinks, she has forged a reputation for gritty, raw and Australiana-tinged storytelling. Wolf is her first album, initially released on cd in 2010. Beast Records is proud to release this record on vinyl for a 300 limited hand-numbered run packed into a new artwork sleeve.